Collections of correspondence can be a fascinating source of historical information and provide a wealth of cultural and social context. They can reveal forgotten friendships, romances and feuds; or offer the evidence needed to piece together a family’s history or business dealings. For me, this sense of a family’s world pulling into focus is made all the sharper when much of the correspondence is conducted via greetings cards and postcards. 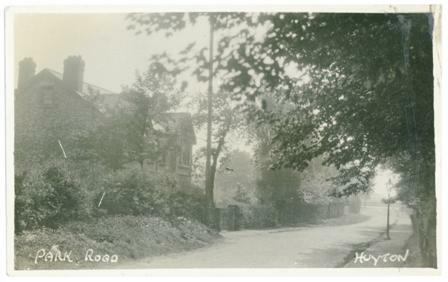 Many of the postcards capture Huyton as our correspondent would have known it growing up, such as this one of Park Road. Here in Knowsley Archives, we have a collection of personal documents, currently being digitised thanks to Heritage Lottery funding, that belonged to a woman brought up in Huyton. Born in 1914, just as the small community (as it was then) of Huyton and the wider world was about to be forcibly and irrevocably changed by the First World War, she grew up during the inter-war years and was able to travel extensively across Europe during the mid to late 1930s, making friends in the different nations she visited and then keeping in touch with postcards written in French, German and English. We also know from correspondence that she became actively involved with the Liverpool Women Police Patrols. In 1939, of course, her life was again dramatically affected by war. This time, her younger brother joined up and was killed in 1944. The surviving correspondence allows us to see the warm, gently teasing relationship the siblings had and the terrible devastation wrought by her brother’s death upon herself, her family and their friends in Huyton. Clearly, the information detailed above survives because of the written word, but it is often given extra meaning and can offer further levels of understanding when the correspondence has been conducted using postcards and greeting cards. The writing itself can tell us about the correspondent’s state of mind; we may wonder why some would write so much, often resorting to filling every available space on the back of a postcard, and others would keep their note to a brief, sometimes terse couple of lines. During the First World War, our young girl’s father (who was serving in the Royal Flying Corps) would send very brief postcards to his wife, often with the message “letter to follow,” but much more detailed postcards to his young daughter, telling her his reaction to news she (or her mother) had passed on and how much he looked forward to seeing her again soon. There is a marked difference in the types of images used to illustrate the cards he sends to his wife and his daughter. For his wife, he often selects postcards that portray the ravages of the war upon Europe: bomb-damaged streets and buildings torn apart. Occasionally these may have a hint of humour to them, such as the card shown above that captures a Tommy resting on a bed amongst the ruins. that they were exchanging cards that made them smile; each trying to outdo the other with cuter or more farcical images. We are very lucky that cards written by both the father and the daughter have survived to be part of this collection, so we can wonder if the “comical” card her father expresses surprise at receiving is the one of the girl dressing in front of her dog below. 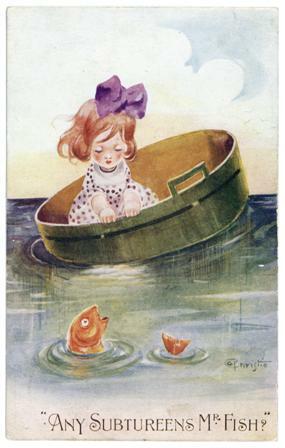 When he sends the card showing the girl floating in the tub he suggests that his daughter is more mischievous than the girl in the illustration and would pull the fish’s tail. Following the First World War (which her father survived), our correspondent enters into correspondence with people from across Europe. 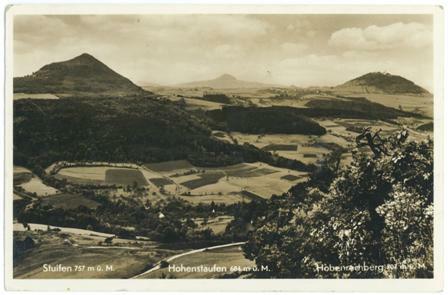 In particular, we have a number of postcards sent to her by a German man. 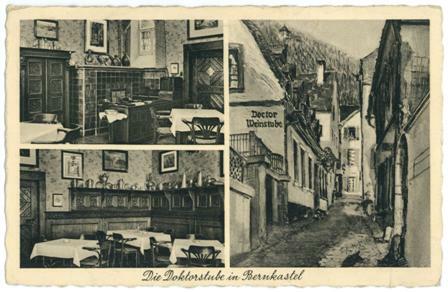 These are interesting documents as pieces of correspondence (made all the more intriguing by the fact that we have no postcards from him following the outbreak of war, so do not know what happened to their relationship), and also offer a visual representation of the pre-Second World War Germany. It is a shame that we are not able to see the postcards that she was sending to Germany – what image of Britain did they present, I wonder? Unfortunately, our collection of correspondence peters out after the Second World War. Other family documents are included in the collection, but there is a special power to these postcards and greeting cards that give us a tantalising glimpse into the life of one family during the first of the twentieth century. A card that may have been selected randomly or with great care can be so much more than a simple exchange of words; it can help to present a far more detailed picture of the world these people lived in and the way that they, and others, perceived it.